That’s how Fred Wilson, a partner at Union Square Ventures and one of the most widely respected VCs working today, answered a question about the crypto market in general and specifically his outlook for Kin, the soon-to-be launched token created by the messaging app, Kik. Wilson made the comment in a small event space on Prince Street in Manhattan, sitting in front of 28 people that Kik had flown in from 13 countries (including Japan, India and Australia), and all of whom seemed to be holders of Kik’s ethereum and stellar token. Kik had brought them together to serve as the first wave of ambassadors for the new token, serving on Reddit, Telegram, Kik groups and anywhere people might want to talk about it. So, when Wilson expressed that mix of confidence and uncertainty, he wasn’t just giving the latest market’s hot take; he aligned himself with a prevailing sentiment in the room, hope mixed with some confusion. A part of his role there seemed to be to induct Kik’s guests into an ever-widening circle of the true believers backing the new model for monetizing digital experiences enabled by kin. Wilson spoke during the last fireside chat of the day, in conversation with CoinFund CEO Jake Brukhman. CoinDesk had been invited to the event to interview Kik CEO Ted Livingston as the the two day event opened. During that conversation, Livingston described himself as a wreck two years ago, as the company lost marketshare to Facebook-owned products. An economy is, of course, one form a community takes, which helps to explain why Kik has invested in forging bonds between its early advocates, expanding the cadre from that early circle that sold the Kik board to a larger one that can sell lots of people using services online. Here’s the funny thing about it’s early advocates, though: by and large, they don’t use Kik. During our interview with Livingston, we asked the crowd whether or not they were big Kik users before Kin came along. Only five or six raised their hand. It’s remarkable because when Kik first unveiled this idea, many people viewed its existing audience as its unfair advantage over potential social crypto competitors. Arriving at the gathering on Prince Street felt a little like coming back to summer camp, with lots of people chatting with that peculiar spirit of reunion. Only it wasn’t a reunion – these people hadn’t met face-to-face before, they had spent a lot of time talking online. Later we would learn that King is one of the most active voices on kin’s Telegram and Reddit channels. “I kind of play the role of the educator,” he told CoinDesk. King was dressed like a lot of the guys at the gathering (it was very nearly all men), in a purple t-shirt and a black-zippered hoodie, apparently in tribute to Livingston, who wears those two things nearly every day. He said was glad to finally get to meet people from the Kik staff in a setting where they didn’t have to constantly speak as if cameras were rolling he said. “In general I just wanted to meet everybody,” he explained. We have known for a long time that people can build real bonds and relationships online as well as offline, but there’s other ways in which online life is not as much like the real world as it could be. And that’s the impetus behind kin: deepening digital reality. “We want mainstream consumers to use cryptocurrency and we think the hardest problem with that is setting up a system, setting up an economy, in a place where they would actually use it,” Livingston told the room. That place is the internet, buying and selling for purely digital goods and services. Livingston said they had focused on picking ambassadors who understood that there was a real opportunity in creating entirely digital markets. In fact, he took it so far that he said he hopes to see such robust digital markets that people quit thinking in kin-dollar or kin-yen terms, and instead thinking fiat terms in real life and kin terms online. Just like people don’t think about exchange rates when they buy lunch from the corner burrito place. As we spoke to ambassadors on the floor, it was clear that they still had questions about how a stable economy could rest on unstable crypto. “There’s things I don’t understand,” Australia’s Will Gikandi told CoinDesk. Gikandi took advantage of every Q&A to pepper each speaker with questions. It was clear that he wants to believe it could all work, but he still doesn’t quite see how. It helps here to step back and revisit what Livingston believes is so big about the kin idea. He saw himself surrounded by peer companies that had successfully built communities but couldn’t make money. The idea of kin is to create a way for all those companies to monetize without ads or user fees. Livingston describes that economy as having two pieces: a cryptocurrency and a software platform that can reward developers for creating active markets for that cryptocurrency. The strangest part of this whole kin idea is that second part, called the Kin Rewards Engine (KRE), controlled by the non-profit Kin Foundation. The idea is that developers will try to build apps that encourage users to exchange kin with each other. So, someone might build an app where users send artists photos and pay them in kin to make drawings of them. The artist would keep all her earnings, but the KRE (which holds 60 percent of the kin that will ever be created) would pay the app’s developer every day relative to the amount of economic activity it created within the whole kin economy. Wilson said that there’s lots of companies in his portfolio who would probably benefit from jumping on the KRE once its built, but he thinks there’s more opportunity with developers just having their first glimmer of an app idea now. That said, USV is so convinced that in the future tech companies will earn so much in tokens that its begun negotiating what it calls “token exchange agreements” with the companies it backs. In these agreements, it would have the option to exchange its equity for tokens a company has earned from doing business (not what they generated by issuing them in an ICO). One member of the audience wanted to know when developers could begin building business models around the KRE? Livingston wouldn’t commit, but he did give his interlocutor a standard by which to hold him accountable. There’s three ways Kik has to lead, he argued. It has to have a blockchain that can support a million users, it has to have lots of regular consumers actually earning and spending in crypto and it has to have a functional incentives system (like the KRE). If any other company starts to show traction in any of those three areas, that’s when kin backers should start getting angry. 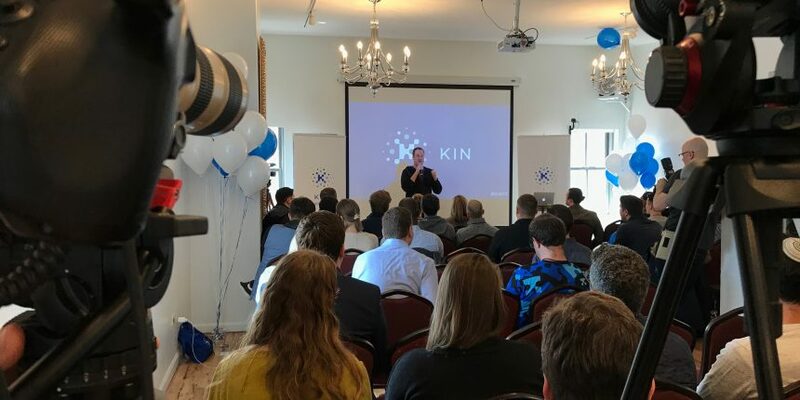 Photo of Ted Livingston welcoming kin supporters by CoinDesk.